Many beginning watercolor artists, when faced with the array of possible paint brushes to buy, wonder if they should go with natural or synthetic brushes. What are the difference between natural and synthetic brushes? Which brushes will work the best? While the answers to these questions may differ from person to person based on personal preferences, budget, and other factors, there are a few distinctions between synthetic and natural brushes that can help you make the right decision for you. If you are a beginner to watercolors, you are welcome to check this video clip, which will help you get started! Once upon a time, natural bristles were the only choice for an artist. Mink and sable were the most popular, although today squirrel is an excellent and less expensive alternative. But with the higher prices of natural brushes and a desire of many to be more animal-friendly, synthetic brushes are a very popular option today. In fact, the best synthetic hair brushes are now made well enough that they can perform admirably alongside natural hair brushes. First, it’s important to note that not all synthetics are equal. A faux hair synthetic brush is made specifically to mimic the qualities of natural fiber, and tends to perform far better than a common acrylic fiber brush. You can get brushes made of faux squirrel synthetic fibers or faux sable synthetic fibers. Faux squirrel would be a good choice of an inexpensive faux hair brush, and lays down a good, even wash. If you have a little more money to spend, you can also get a blend of faux synthetic hair and natural hair. While many beginning watercolor students feel that the common synthetic fibers suit their needs just fine, others may find it frustrating, as acrylic fibers tend to dump their load of color as soon as they touch the paper, leaving a less even and a paler trail of color as the stroke progresses. Finally, for someone who is serious about using the best quality brushes, the ideal watercolorist’s brush is the Kolinsky sable. Though it can be a bit harder to come by and is considered to be an expensive brush, it is undoubtedly a high quality brush that most any watercolor artist would be satisfied with. 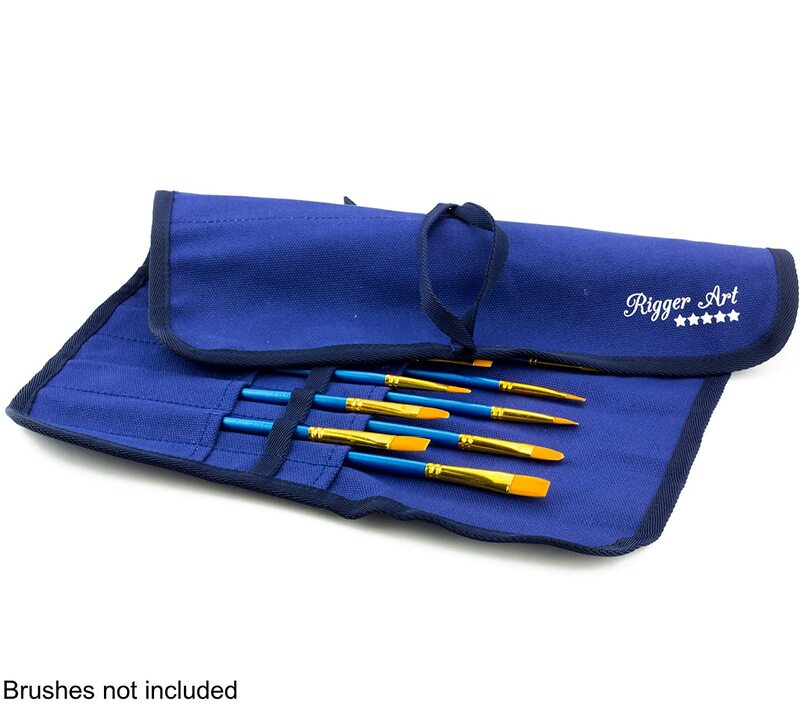 Painters bundle kit – Including 6 brushes, folding palette, and carry on bag for your art stuff. For those who wish to get the best brush they can afford, forgo the cheap, larger sets of watercolor brushes, and choose only one or two round brushes, which tend to be used for most watercolor work. Then add one or two flat brushes for chiseling in edges and laying down a wash. This is a good compromise that can help you get started with decent quality brushes, without spending a fortune. 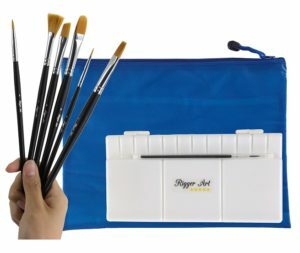 Get the watercolor bundle set at Amazon, including brushes, palette and mesh bag. (See image). This entry was posted in Painting Brushes, Videos and tagged Acrylic Brushes, PaintBrush Shapes, Paintbrushes Set, painting brushes, Rigger Art Brushes, watercolor brushes, Watercolor Paintbrush by RiggerArts. Bookmark the permalink.